“It has been said – and I admit that it’s a perfectly legitimate assessment – that the best thing is not to be born, while the second best is to die early” (Institutes 3.9.4). 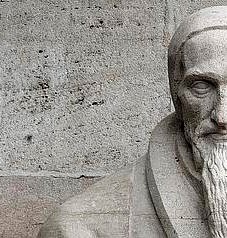 Calvin did not live in happy times, and he was not a happy theologian. He was, like many of the greatest thinkers of our tradition, a troubled soul. Over all the pages of his works there is something of the hospital waiting room, a lingering air of grief and wretchedness. Some people don’t like that about Calvin. They want to see their theologians smile. But for me Calvin’s unhappiness is one of the things that makes him worth reading. Not that mere wretchedness is good for anyone. But wretchedness translated into art is a balm for the spirit. That is why we love Greek tragedy and Homer and the Book of Job – and why we ought to love reading Calvin. I do not mean to say that Calvin’s theology is joyless. How could it be? It’s a theology of predestinating grace, of Christ and all his benefits, of the Holy Spirit poured out in human community. Theologically speaking, there’s joy around every corner. Calvin believes in joy and blessedness: he believes it by the skin of his teeth. He is a pastor of refugees. He lives and works and prays among the wretched of the earth. As a general rule, when Calvin wants to describe the life of blessedness he resorts to theological clichés. It is when he takes up the theme of misery that he speaks in his own voice – and what a voice! He is not like Shakespeare who can write comedy with the right hand and tragedy with the left. Calvin’s genius is all for tragedy. His greatest preaching was the mighty series on the Book of Job. I know a fellow who converted to Christianity after reading Calvin’s sermons on Job: a reminder that happy thoughts are not always the best medicine. “Noah spent a great part of his life constructing the ark with great inconvenience and suffering, while all the world rejoiced in delights and pleasures. The fact that he escaped from death turned into a greater misery than if he had died a hundred times. For besides the fact that the ark was like his tomb for ten months, is there anything more difficult or unpalatable than to be kept so long plunged into the dung and filth of the animals in a place without air? After having escaped so many difficulties, he fell into cause for new sadness…” – and so on! Noah always seems pretty cheerful in the rainbow-coloured illustrations of children’s Bibles. He is pictured as a congenial zoo-keeper. We take for granted that he liked the animals. It takes the genius of Calvin to make us smell the dung and breathe the stifling air and see a poor man cringing in the darkness of a floating tomb, his sad heart filled with loathing for all beasts and fowls and everything that creeps upon the earth.